Stewkley Singers have kicked off a busy 2019 with rehearsals for our Spring Concert, to be held on Saturday 18th May at All Saints’ Church in Leighton Buzzard. 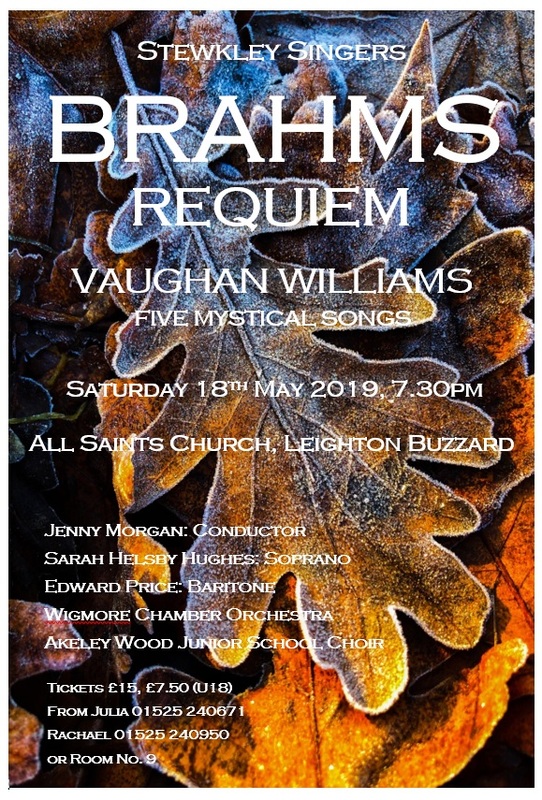 The choir will be performing Brahms’ inspirational “Requiem” with professional soloists and orchestra, and we hope that you will save the date and join us for what will be a real musical treat. Brahms broke from tradition when writing this work and used a libretto which he developed himself, calling the work “a human requiem” in a deliberate move away from following the traditional Latin text. This tuneful and Romantic work is one of the cornerstones of the choral repertoire and is particularly famous for its fourth movement which is often performed on its own – “How Lovely Are Thy Dwellings Fair”. Alongside the Brahms, the choir will perform Vaughan Williams’ uplifting “Five Mystical Songs” with baritone soloist Edward Price. We are looking forward to seeing you there. Please come and support your local choral society in what is one of our most exciting concerts to date. Having an audience to perform to makes all the difference and we are working hard to make this an evening to remember. Tickets are available from Julia on 240671 and Rachael on 240950 at £15 (£7.50 under 18). The Stewkley Singers was founded in September 2006 and now comprises a friendly choir of approximately 60 singers aged between 15 and 88 (young people from Year 7 upwards are welcome). We meet in the main hall at St Michaels School, Stewkley on Thursday evenings throughout the Autumn and Spring terms. New members are welcome; please call our Secretary, Ron Sims, on 01525 240671. Members come from Stewkley and outlying towns and villages, including Wing, Whitchurch, Cublington, Soulbury, the Brickhills, Adstock, Woburn Sands, Leighton Buzzard, Milton Keynes and Aylesbury.